The FamiLee Jewels: September Blog Carnival: What's on Your Workmat? September Blog Carnival: What's on Your Workmat? 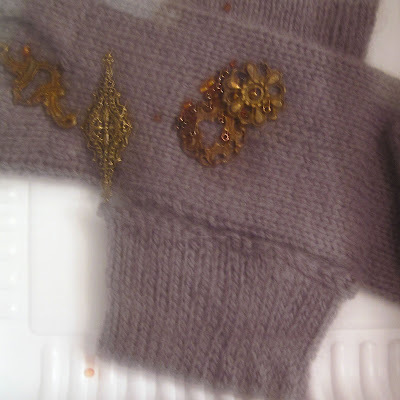 Prioritized project: Fingerless gloves waiting for embellishment. 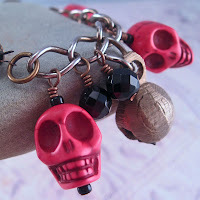 Septembers Starving Jewelry Artist's Blog Carnival topic is What's on your workmat? Hello my name is Bonnie and I ponder and start and work on many projects at one time. My brain works faster than my hands can keep up. A new idea can be inspired by a current project, a picture in a magazine, the color of a sunset, a dream, or a great piece of hardware from a salvage shopping trip. I feel the need to capture the brainstorm in a concrete manner so that it doesn't slip away. That compulsion translates to multiple mats. A mental health professional might call this flight of ideas. Skary skulls. Off the mat! Just finished: an entire Halloween collection of Spooky spiders and Skary skulls in every color of the rainbow. Off the Mat! In progress: a chainmaille bracelet done except for the clasp that is for the Visions of Hope fundraising event to benefit our hospitals Cancer Treatment Center. The bracelet is on the mat because the crystals in it are pink and I am almost sure that they want to be black. I am waiting for them to decide. Then there is the "stack-o-mats", a pile of nesting plastic boxes that each holds a project. 2. Special order for a wedding. On the mat until I find the right color blue beads to finish them. Necklaces: still on the mat. 3. A pearl and rhinestone bracelet waiting for me to have the patience to string all those tiny beads. Still on the mat. 4. A pair of beautiful fingerless gloves (hand knit by my daughter Lissa) that I am embellishing with beads and salvage to wear at shows. On the mat since May when I received the gloves. Now that the weather is cooler these are a priority. 5. A series of necklaces with acrylic donuts as the focal point. On the mat to be finished before our next show on October 8Th. I am looking forward to finishing up some of these projects and fessing up has made me prioritize them. Fabulous photos of completed projects to follow. Projects in waiting, otherwise known as "Stack-o-mats". That's creativity. Some people plan, some people play. It seems to me you are doing quite well by playing! This seems like organization to me! 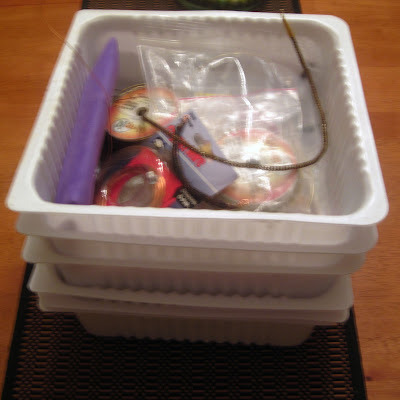 This is how I do it, too, except I use ziploc baggies for the projects to be, and keep them in one of those dorm crates, which my college daughter decided didn't fit in her room last month when we dropped her off. I've gone the ziplock route also, and still use them for portable projects. Handy little inventions! Those gloves are so pretty, look forward to seeing what you do with them. You have given me some great ideas here - I like the litte trays. 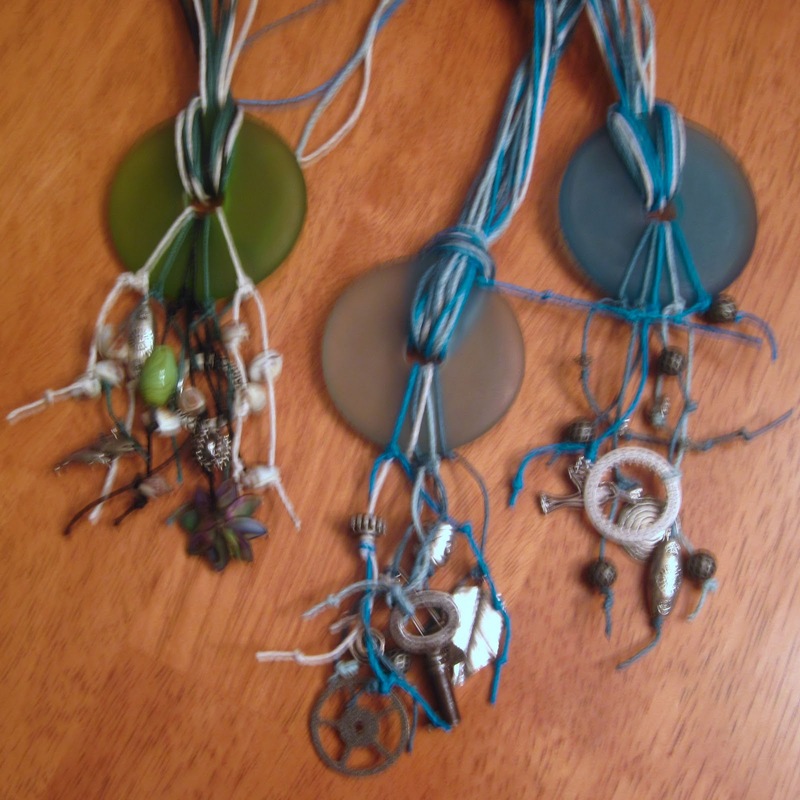 I bag my patterns/beads for the loom but didn't think about it for the other work I do. The little trays are packaging for medical equipment. I saved them for a few weeks and now have a stack of 10 that I can use. They are pretty sturdy and I like that they nest so they take up less room on the work bench. Wow, so many projects, you are a busy lady. Love that.